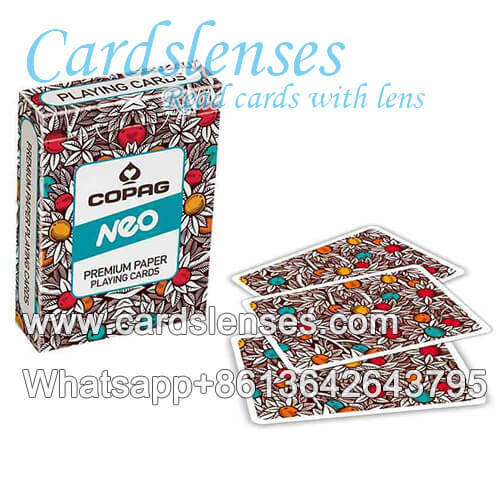 Copag Neo Nature infrared marked cards for sale are using top quality materials and state-of-the-art technology; these 100% plastic playing cards are manufactured just like the cards featured on televised poker tournaments. Copag Neo Nature marked cards are suitable to use in private poker room, casino and any other indoor gambling game. For example, if you are the boss of casino, you can use marked cards and infrared camera to check if someone plays cheat during the game. Once they change the playing cards on their hand, you could notice it immediately. You can protect your interest by marking playing cards.